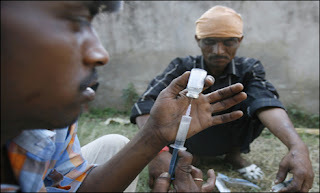 NEW DELHI: United Nations drug report 2011 has said that India is the biggest consumer of heroin. Of the 40 tonnes produced in south Asia, nearly 17 tonnes are consumed in India, the biggest consumer in the region with the trade valued at $1.4 billion. While speaking at the release of the International Narcotics Control Board (INCB) annual drug report for 2011, Narcotics Control Bureau director general O P S Malik said the rising student population in some cities in south and western India has been the biggest consumer of drugs. Besides heroin and designer drugs use, the upwardly mobile population in metros have also been reason for India's rising demand for cocaine. More than 23 kg of cocaine was seized in Mumbai last year, a small percentage of the total consumption. INCB, a UN agency, reports that only 15 out of 40 tonnnes of heroin produced in the region was trafficked towards south-east Asia, Africa, North America, China and Europe. The rest all was consumed in the region, and majority of them is in India. 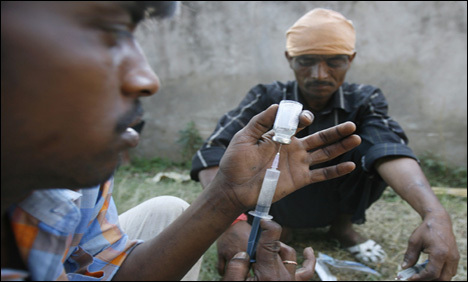 The report estimates nearly three million opiate users in India, half of them being synthetic opiates. And of the 17 tonnes of pure heroin used, eight tonnes are of Afghan origin and nine tonnes are indigenously manufactured.